The fumes of masalas and heavy curries leave stubborn grimes on your kitchen ceilings and cabinets, lowering the overall aesthetics of your cooking space. Steer clear of this issue with Kutchina Eiffel chimney. The model has a high suction power as it is equipped with a high-power electric motor. It keeps your kitchen smoke-free by drawing all the cooking fumes out of your kitchen. The stylish amalgamation of glass and steel in its body gives this model a sophisticated look. Also, this model is simple to use as it features easy-to-use touch controls. Nothing beats Indian dishes in terms of richness in taste. However, they can take a toll on your kitchen’s aesthetics as the oils and fumes of heavy masalas form grime on the cabinets and ceilings. Get rid of this issue with Kutchina Fieona chimney. Designed for Indian cooking style, this model has a high suction power and keeps your kitchen free from oils and masala fumes at all times. You don’t have to face the hassle of cleaning this model as it comes with the innovative 3rd generation dry auto clean feature which automatically cleans the filters. The stylish design of this model makes a lasting impression. Kutchina Elizza White chimney has an edge over other chimneys as has everything that a good chimney should have. 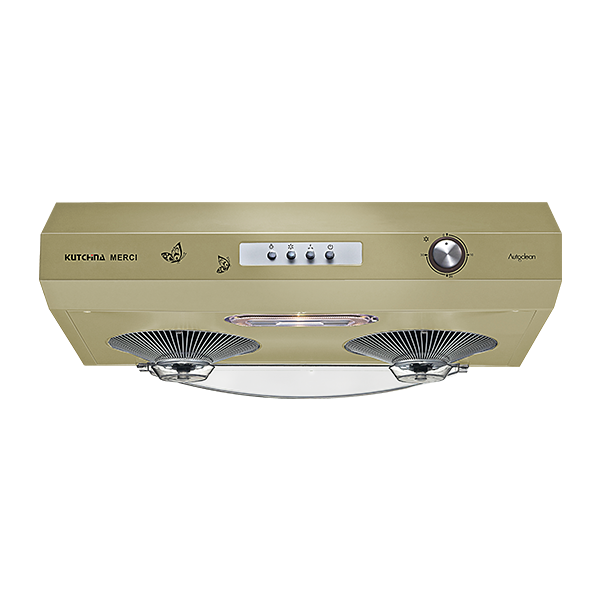 It has high-suction power, mount type installation, ductless design, stylish look and is low maintenance. This high-power electric motor ensures a high suction power on this model. It also incorporates the 3rd generation dry auto clean feature which eliminates the hassle of manually and frequently cleaning the filter. Due to its mount type installation, it draws all the cooking fumes out from your cooking space. The ductless design makes this model easy to install and use. Lastly, its sleek look and glossy finish add a modern look to your kitchen. A 65 litter Built-in- oven with knob controlled operations makes it easy to use. 9 standard cooking functions, dedicated rotisserie for roasting and upto 2 hours of cooking timer. For strong convection 3 heaters are placed at top bottom and rear edge.